It’s hysterically demented – check it out if you have a few minutes. 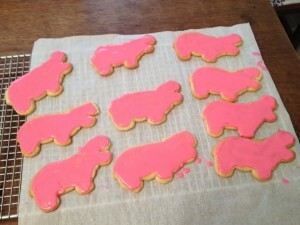 A few weeks ago, I made my kickball team (the Kickopotamus) these adorable hippo cookies and frosted them in pink (our team color). So I decided it would be fun to do the same for Steve’s team. Originally, I thought I would find a badger cookie cutter and make honey sugar cookie dough. However, badger cookie cutters are as popular as you would think, which is to say I could not find one. Not to be deterred, I contacted someone on Etsy.com and inquired about a badger cutter custom made. It was $45 and would take 3 weeks. I was not that committed to the idea. Plan B – I would just go with the honey of the theme. I could not decide on which recipe to try, so I made two different kinds. My first cookie, honey sugar, was my favorite. I made a novice mistake and used twice the butter, so they were very thin and flat, but they were still delicious. I could really taste the honey flavor. Preheat oven to 300. Line baking sheets with parchment paper. In a mixing bowl combine flour, soda, and salt. Cream together the butter and sugar. Add the honey and cream well. Slowly add the flour mixture and mix until just incorporated. Finish by hand if needed. Do not over mix the dough. Drop dough by rounded spoonfuls into bowl of sugar and roll to coat. Place on prepared baking sheet and bake for 15-18 minutes until edged are golden and set. Allow to cool on baking sheet for 5 minutes before transferring to rack to cool completely. *I chilled the dough a bit before baking so the cookies did not spread too much. If you chill too long though the honey will harden and make the dough hard to scoop out. 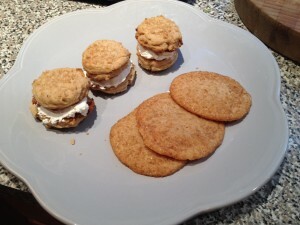 The other recipe was a honey almond butter cookie, using almond butter, instead of peanut butter. 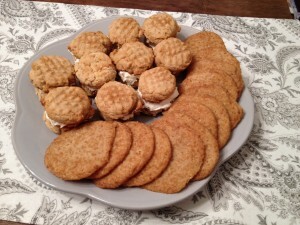 I liked the texture - it was like a sandy shortbread, but I felt it wasn’t sweet enough, so I decided to make a honey buttercream frosting and sandwiched the cookies together. The frosting helped, but I still think it was not sweet enough. I would use the frosting recipe again for another cookie or cake. Heat oven to 375 degrees. Grease a baking pan. Sift together the flour, baking powder and salt. Set aside. Mix other ingredients in a mixer. Beat well. Stir in dry ingredients. Form dough into balls. Flatten with a fork or the bottom of a glass. Bake for 10-12 minutes until blonde, but not brown. Wash out bowl of stand mixer and dry. Add butter and honey and beat until combined, about 2 minutes. Add confectioners sugar and salt and beat until light and fluffy, about 5 minutes. Taste; if desired, add more salt or honey.